Is The Way To Go!" When it comes to garage heaters - radiant floor heating is the most efficient and uniform system you can install. An added benefit is that it is dust free! It radiates heat from the concrete mass of your garage floor to every part of your garage or workshop, and is cheaper to operate than any other form of heat with no mess or fuss. There are pitfalls that can occur that will cost you thousands of dollars to remedy, so you need to know the details of the systems before you enter into a contract — or tackle a do-it-yourself project. 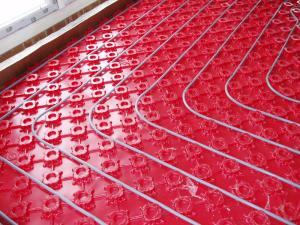 There are two basic approaches you can take to fueling your radiant floor heating system. They come down to either fossil fuels such as home heating oil, natural gas, liquid propane — or electricity. In some cases, if you have no access to fossil fuels you may have but one choice, being electricity. No matter which fuel type you use, the next thing you will need to consider is what type of delivery system you plan to use. If your fuel is electricity, you can use either a conductor heat element (electrical) embedded in your concrete mass, or you can use a liquid such as water or anti-freeze (hydronic) that is heated electrically and run through P.E.X. tubing embedded in your concrete floor mass. If your fuel type is fossil fuel you will be limited to the P.E.X. tubing delivery system to get the heat to the concrete mass. The image at the left shows a typical P.E.X. layout within a spacing grid ready for concrete placement. The grid helps hold the tubing in place and allows the forming of corners that are uniform. Insulation below the concrete mass is of extreme importance as are moderately well insulated walls and ceiling / roof areas. The below concrete slab insulation should consist of 2" thick rigid foam that also runs down the interior face of the stem walls that go to the footing below grade. Radiant floor heating is a complex subject and before you get involved with a contractor, or tackle a do-it-yourself project, you may want to consider getting educated on all of the possible mistakes and pitfalls by a professional who has successfully done this type of work in the field — and save yourself Thousands of Dollars to remedy costly mistakes after the fact.